Anglia Square | Santa Claus Comes to Anglia Square! 16 Nov Santa Claus Comes to Anglia Square! On Thursday 20th December, from 10am -3pm, Anglia Square shall be transformed into Santa’s grotto! Santa Claus is coming to visit all of the children in Norwich, and he’s bringing some friends with him! Get the chance to meet and have your photo taken with The Grinch and The Gingerbread Man , before meeting Santa Claus himself as he waits in his grotto. You will also get an early Christmas present, although he knows if you’ve been naughty or nice! From 10am -11am Santa will only be seen in pre-booked time slots. This is for individuals with Autism to visit in ‘Autism Hour’, and be able to experience Santa in less busy and quieter surroundings. Please email chloe@thissolidground.com to book a space. Please may only individuals with a booking turn up to Santa’s grotto at this time. We suggest a 50p donation to children’s charity Break to see Santa, to help vulnerable children and young people across East Anglia this Christmas. Hollywood Cinemas will also be having Kids Club at 11am everyday during the Christmas holidays, showing new Christmas film The Grinch! 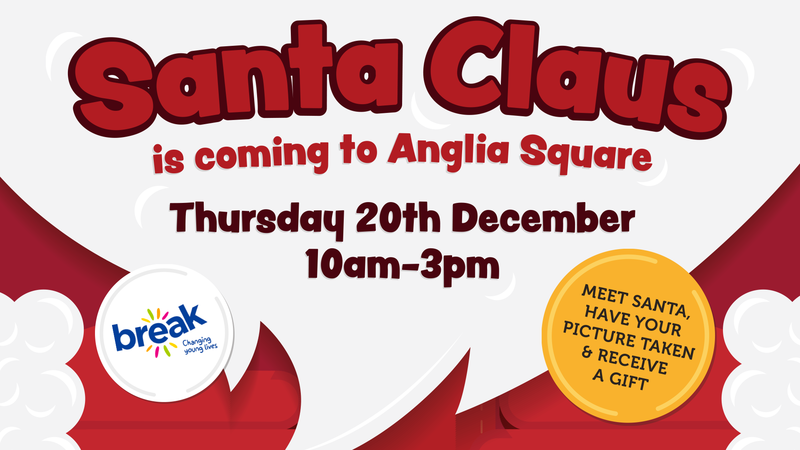 We look forward to seeing you then, Santa Claus is coming to Anglia Square!